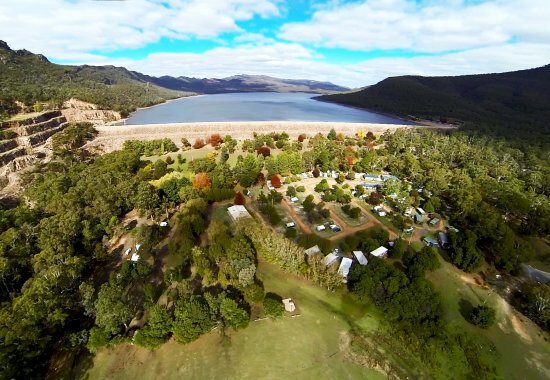 If you want proper forest camping, look no further than Halls Gap Caravan Park. A three hour drive from inner city Melbourne, the Grampians National Park is a display of Aussie natural wildlife, flora and fauna, accessible walking trails and off-road driving. There’s space to pitch a tent, cabins and also spots for caravans. The onsite amenities and small supermarket across the road, make it a perfect spot for new adventures or seasoned pros. With 30 walking trails to choose from it’ll be difficult to get bored. If you’ve done all the trails and are looking for something new, try Mackenzie Falls a 25 minute drive away from Halls Gap. The trail features a stunning waterfall and a safe and accessible trail. The best time of year to brave the Grampians is from October – April, where during the day you’ll get summery weather of 20-30˚C and minimums of 7-14˚C. Remember Melbourne weather is super temperamental, so plan for any type of weather change. Nothing beats a true-blue Aussie adventure. Durras Beach offers everything you’d see on the movie screen from camping amongst kangaroos (Durras Lake North Holiday Park offers refunds if you don’t see any kangaroos – cool, eh? ), possums, goannas and a million species of birds. Like the Grampians, at Durras Beach you can enjoy your stay in cabins, cottages or pitch a tent. If you’re down for it all, Durras Beach can offer it; swimming, surfing, snorkelling, canoeing, cycling, trekking or just having a lazy beach day can be the combo for a perfect get-away. Durras Beach also offers hot showers, toilets and wood-powered barbecues to cook up a storm. Approximately a three to four hour drive from Sydney, or a two hour drive from Canberra – it’s perfect drive to truly feel off the grid, when you’re not really. Whether you’re a father of three or a man looking for a bit of a breather, it’s got it all. Want a bit of everything? From woodlands to sandy beaches up to the tip top of rocky headlands, Queenslands Hinchinbrook may be just what the travel doctor ordered. With a short two hour drive from Cairns or Townsville, you’ll find yourself arriving in no time, and you can further access Hinchinbrook Island by a 45 minute trip by private vessel, water taxi or ferries (which run daily). As a first camping trip, Hinchinbrook may not be exactly for you but feel free to give it a go! The island only caters to the self-reliant – you’ll need to pack everything you need, from clean water to fuel stoves. It’s the ultimate camping adventure for those who don’t need anything but their camping equipment. The best time to experience Hinchinbrook, is in the drier months of May – October. Typical QLD all extremes can be experienced, reaching 27˚C and even colder nights. Feeling adventurous? We say, give it go. Let your inner beast out, and take on the mountains. Flinders Ranges is tucked inside the middle of South Australia, and captures the ultimate landmarks and gorges with hopefully a siting of a rare yellow-footed rock-wallaby. Breathe in the fresh air, with breathtaking trails and hikes, but just make sure to check in with the Bushwalkers Register at the Wilpena trailhead if your planned hike will take three or more hours. You can experience the highest peak in Flinders Ranges with a rewarding 14km or 21km trek. The Flinders Ranges is a long-haul drive, of five and a half hours from Adelaide. But, it’s totally worth it for a change of pace. Experience the Flinders Ranges in all their glory, by setting up camp at either Wilpena Pound, Bunyeroo Gorge, Brachina Gorge and Aroona Valley. All these sites feature toilet and fire pits with grills to indulge in the luxury of the outdoors. Easy. The renowned Margaret River, is a must for any Australian or tourist. A three hour journey from Perth, will get you luxurious vineyards and a rugged coastline in the heart of nature. You can beat the crowds and experience whale watching, canoeing, bird watching, white-water rafting, trekking and many more adrenaline junkie activities. Strap the surfboard to the roof and take off, for a laid back or high impact get-away Margaret River is all yours. Basic amenities are offered like a shower and toilet at any of the surrounding campgrounds....or you can go with the cheeky glamping option like in the pic. Tempting, eh? Make sure to stop by Cape Leeuwin Lighthouse, the tallest lighthouse on Australia’s mainland that reaches 39 meters. Take in the incredible view of the only place to spot the meeting point of the Indian and Southern oceans. This Aussie gem is favourable all throughout the year, however rainfall is the heaviest between April and October. And quick reminder – don’t forget to pack the essentials; Heso’s shave cream, after shave and moisturiser are no-fuss products, that can let you get on with it and take in all that the great Australian outdoors has to offer. So what are you waiting for? On you go!